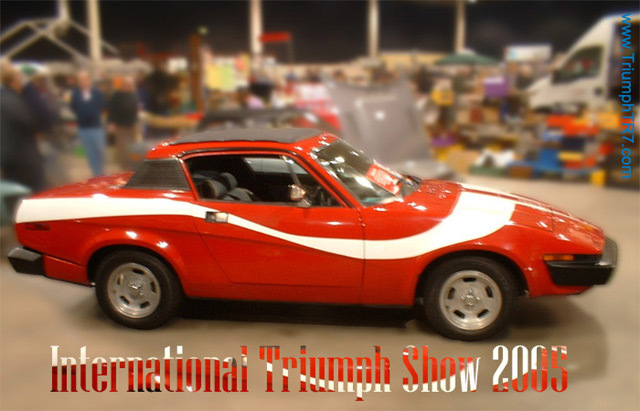 So once more we travelled the short distance from South Leicester to Stoneleigh in Warwickshire - only this time it was an earlier start than normal as TRisha TR was making an appearance on the TR Drivers Club stand, alongside Chris Turner's quite fabulous 'Coca-Cola' liveried TR7. After a Saturday of polishing the car - actually that's a lie.... the polishing was done on Friday having taken a day off work!!! Well the car is used over winter and there was a fair bit of dirt to clean off. Thankfully Friday & Saturday were bright dry days - unlike Sunday when I awoke to a constant drizzle. So Sunday - and what a bad start. Some muppet had left the interior light on! Meaning I may as well tried starting her with a 1.5v AAA battery from the TV remote. After a little shuffling of cars I was able to jump start her. And 20mins behind schedule set off for the show. Having stook rigidly to the speed limit all the way - the 90mph mark was not passed at any time officer, it's delimted to 70mph. With the Rain-X on the screen allowing the window-wipers to remain parked we were soon ushered through the gates and directed to the hall. Thankfully the rain had ceased which allowed some cleaning to be done outside whilst the rest of those doing the stand manning completed the initial set up. We then did a bit of manouvering to get all 4 cars (2xFHC and 2xDHC) on the stand - hats off to Phil Humphries from 'creeping' the stand size!! With a final rub down (the cars, not the owners), t-shirt changes for Chris & myself (!) and with the club flag held in place by TRisha we were ready to rock n roll. The TR Drivers stand was next to Club Triumph which was great as it made it easier for me to chat a few of the guys I know, through being a member of that club... I still missed the 12:00 o'clock gathering which had been arranged on-line, but more of that later! The proximity of their stand also made it easier to get in some early shots in the GT6 vs TR7 friendly fire ribbing, as I suggested that Tim (GT6) would now have some decent cars to look at all day. I should also point out the Club Triumph, who had a fine selection of vehicles, carried off the 'best club stand' award - a worthy award, well done to all those who helped in that success. Unfortunately my camera card was full when I went to take a snap of their stand at the end of the day.... though looking at most of the images I took the photo probably wouldn't be usable. The day itself was a huge success - Club Triumph looked very busy all day and we were certainly very busy on the TR Drivers stand. I don't know how many new members were signed up but at one point there was a queue! The cars on the stand did attract a lot of interest - with Steve's DHC having travelled over from Norway. In my opinion the cars on the standard worked well - with two metallic DHCs and the primary colours of TRisha and the Coca-Cola car. From the time the doors opened there really wasn't a great deal of time to chat with the other guys doing the stand-manning - indeed it wasn't until the 'Show will be closing in 30 minutes' warning went out that I had chance to talk to Steve and find out just why his DHC had got the early single-bump bonnet. With a steady flow of enthusiasts to the stand I didn't notice that the noon had come and long since gone. 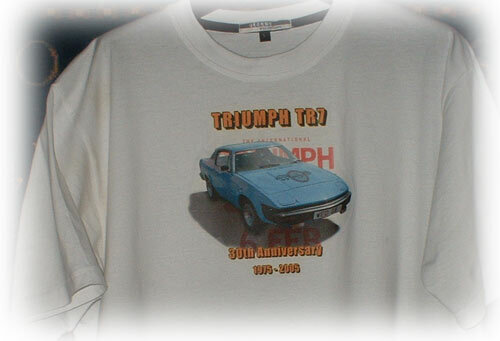 I was vaguely aware that Club Triumph had a small gathering but really such was the pace of things and number of visiters to their stand that the gathering was not out-of-place. With hardly a break from the start of the show I finally grabbed my lunch at a little after 13:00, another hour and a half later I eventually managed to sneak off to eat them! Yes we really were that busy. It was great to meet people I've corresponded with through the forums or via e-mail, though a shame that we didn't have much time to chat n some instances - I also saw a few others drfit past who I have met before but on this occasion was otherwise engaged. 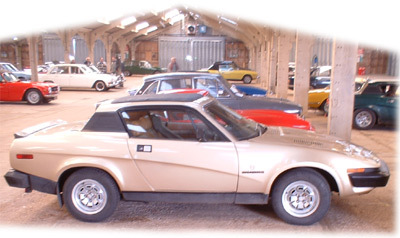 By the time I made it to the Triumph parking there were only a handful of cars left - with just a few TR7's dotted around. So I missed the Cosworth powered wedge which had been there earlier in the day. As I wasn't really after buying anything (that makes a change in itself) I wandered around the show but had no need to really look in at the auto-jumble - the co-pilot would have been pleased about that had she been in attendance! 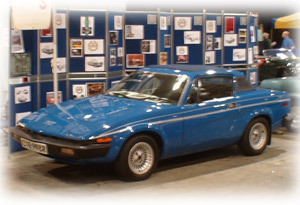 There were a couple of TR7's for sale both, I thought, a little on the high-side but maybe prices of TR7's are increasing? 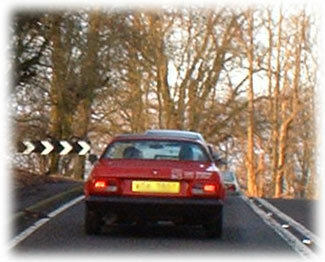 If they are then it is aided by the coverage the car is getting recently - most notably in Retro Cars magazine. The general feeling was that despite the poor weather initially the day had been a, errr well a Triumph I guess. The weather was good enough to push the sun roof back for the journey home, and I had opportunity to hold the camera up and snap Chris who was in front... yes to make room on the memory card I did delete an image whilst on the hoof tsk tsk. So after a successful start to the 2005 shows we'll look for an increase in attendance at the nationals, and club meetings (especially those new areas! ).